Dogs are descended from gray wolves. Dogs are not only considered man’s best friend, but scientists have long known that dogs are also man’s first friend. Dogs were the first domesticated animal. While the exact timeline of dog’s domestication is unknown, researchers at Durham University in England estimate that dogs were domesticated about 15,000 years ago. According to Dr. Robert K. Wayne, a canid biologist and molecular geneticist at UCLA, modern dogs only differ from gray wolves by 0.2 percent of their DNA. This is a very small difference considering that, according to Dr. Robert K. Wayne, the wolves’ closest wild relative is the coyote, who differ from them genetically by 4 percent making dogs 20 times more closely related to wolves. 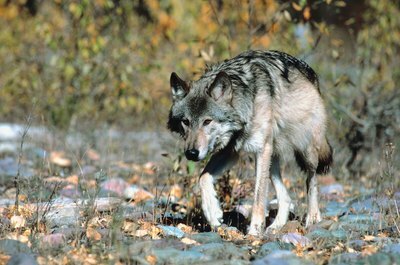 While genetics clearly show the link between the gray wolf and modern dogs, thousands of years of crossbreeding make it difficult to place any one breed as being more wolf-like than another. While it is difficult to determine which breeds are the most wolfish, scientists have been trying. In a project termed CanMap, a collaboration among Cornell University, UCLA and the National Institutes of Health, scientists gathered DNA for nearly 1,000 dogs across 85 breeds for analysis. They found that the four dogs closest to their wolf ancestors are the Shiba Inu, chow chow, Akita and the Alaskan malamute. However, this study was done on 85 breeds. Future studies done with more breeds may indicate different results. According to professor Merete Fredholm with the University of Copenhagen, scientists used to believe that all dogs were descended from a single wolf pack in China. Recent research however indicates that many different civilizations domesticated dogs at different times. Meanwhile researchers at Durham University in England are discovering that modern dogs do seem to be exclusively descended from gray wolves. There has been so much crossbreeding in recent history however, that modern dogs have little genetic resemblance to their canine ancestors and tracing a direct link back from one breed directly to a wolf is next to impossible. Researchers at the Durham University also point out that our modern dogs have little in common in behavior and appearance compared to dogs just a few hundred years ago. Modern dogs have been bred to specific tasks during the millennia, and during the past few hundred years in particular have been bred for specific personality traits as pets. This continual trait specific and crossbreeding have changed them completely from the wild wolves they once were. Based in Denver,Thomas Ochsner splits his time between writing and helping transport sick and injured pets to emergency care. His work has been featured in the "Denver Pet Network" and "PupaDay" magazines. Do Cats See in Color or Black and White? What Country First Domesticated the Cat? Why Do Dogs Hide Their Bones? When Do Dogs Grow Out of the Puppy Stage?